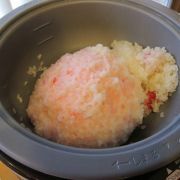 Sweet rice soaked overnight is ready to be steamed. 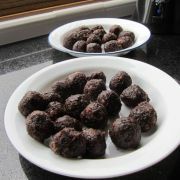 Homemade red bean paste balls. 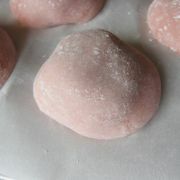 Just red beans boiled with sugar. 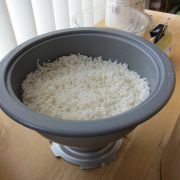 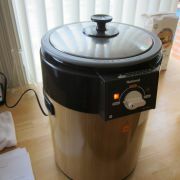 The rice, steamed by the mochi maker, starts to be kneaded. 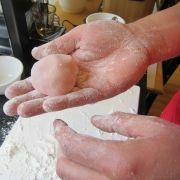 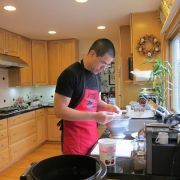 Forming the mochi by hand. 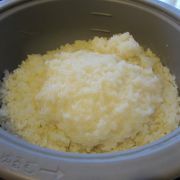 Corn starch prevents sticking to the hot rice. 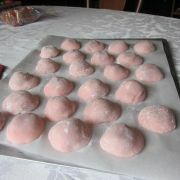 An array of finished product - not nearly as nice looking as the ones you can buy, but fresh! 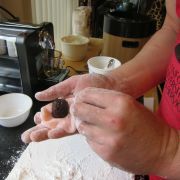 The rice dough tends to sag a bit, but there is a tradeoff between having enough water in the dough to keep it pliable for a long time, and having less water for structural stability.